Need for Community + Holiday Season = Stressed People. We want our tribe gathered around us. We need our people. But church events and Christmas programs and work parties–oh my. Where do we scrunch one more thing in? People are busy—but a place to enjoy one another and form community—from which gain the strength to go back out into the craziness? That could be just our chance to be people of peace this winter. So for the next two weeks, I’m going to find some easy ways to do that. We’re going to jump ahead to Christmas ideas and the come back here for thanksgiving afterward. Backward, I know, but it wouldn’t be much help if I gave you Christmas celebration suggestions at the end of December, now would it? But I promise you, there is a good thanksgiving series coming. How can we be hospitable to our tribes? How can we meet new members who might need our peaceful refuge? While we are inviting others over, we can begin conversations of peace around the table. That would be a great offering during this contentious year. So, some ideas for getting people to gather around. Meant to be easy. Intended to be jumping off points for going deeper with people you treasure. Or new people you want to know. Do not stress over making it perfect! Assemble a few things and go. Find one you like and have fun! Everyone brings their favorite holiday story or poem to read. Those who prefer a full length novel will have to take it down a bit. This is the 21st century. We can’t spend all day listening to Christmas Carol. This is good for kids or adults. Have everyone bring their own cookies and/or cupcakes, and you supply the decorations. Or vice versa–go buy some plain cookies and have others bring their favorite toppings. Just watch that kid from down the road who will use ALL the rainbow sprinkles if you let her. Exchange afterward if you want. Or bring the treats around to your local police station, fire department, library staff, etc. Everyone has to wrap their gifts, right? Why not do it together? Have people bring paper, you supply bows, ribbons, tags, etc. You can have a corner for people who like to go nuts making their own intricate gift tags. They can share. Instead of cookies, bring favorite finger foods to swap. Everyone will have some to eat and go home happy. OK, this one may be less peaceful than other options, But it could be a great deal of fun. Plus blackmail material on your friends for years. Rent a machine and give everyone a chance to sing their favorite Christmas songs. Except Santa Baby. Delete that option. Just no. This is my favorite. Ask guests to bring something off a donation list for a charity organization. Some options include: items for stuffing shoeboxes to deliver to kids overseas. Household items for a refugee family moving in. Care packages for soldiers. Possible links are below. Add your good ideas in the comments! World Relief Welcome Kits here for general information and here for Chicago area list. Operation Christmas Child shoeboxes for children info here. Support Our Troops care packages and letters to troops. Packages for the homeless. The best thing is to contact a local shelter for their wish list. They will almost always have one on the website. But here is a great list of items. This is just what it sounds like. Set a date for everyone to bring sleds, and you serve the hot chocolate afterward. Adults are absolutely required to play! We need each other, and we need each other especially during the stressful times in our lives–like now. It’s in those times we pull back and focus on our own little worlds, to our detriment.Simple hospitality makes yours a joyful place in a hectic world. 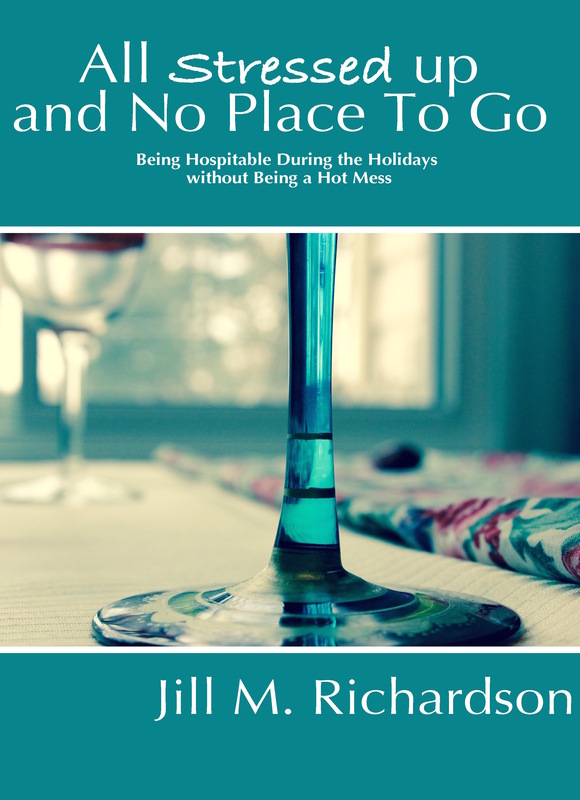 And don’t forget my free ebook, All Stressed Up and No Place To Go—dealing with holiday stress and remembering the reason we’re celebrating.